We found that 42% of staff are more motivated in December. Is there a correlation between busy periods and sickness? 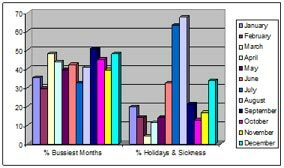 The graph below compares the busiest months compared with the months of high Sickness & Holidays. In March we see business increase from 29% to 48%, workload increases massively at the end of the first quarter of the year – make sure you plan for this workload increase! December shows that 48% of businesses are busy yet it also shows that holidays and sickness are up to 34%. Does that mean that holidays are taken during this time for Christmas or last minute holidays before they run out? Do we need to factor this into our work plan for the month? This has an impact on 48% of business having an increase in workload or is due to lower staff levels rather than workload? We see a massive drop in workload during July to 33% a slight increase in August to 40% however, during August holidays and sickness increase to 68%. Now does that mean that business is quiet because staff are off or do we take time off because business is quiet? 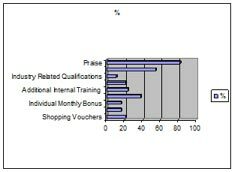 As you can see there is a fantastic variation on how we reward staff, 82% tell them they have done well, 55% treat them with Social Events, however only 11% of us incentivise by putting staff through Industry Qualifications is that because there are no relevant qualifications available of is this something that business have thought about before or has the training budget been cut due to recession? We also had some other fantastic responses such as rewarding staff with "time off", "birthday and Christmas presents" and my personal favorites and I am sure we would all like to work for this employer "International trips to Hawaii Puerto Rico etc", there was also a comment that said ‘fear’ was a motivator!!!! 72% of Managers find it harder to motivate their staff during the quieter periods, does this mean as a business we should look at trying alternative types of motivation during these periods? Would it be good to have small competitions and awards during this period? Or would it be more beneficial to look at giving staff alternative work projects to look at during these lulls or is it better to take staff out of the business during the quieter period for Staff Training? 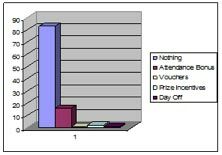 The graph below displays how Managers motivate their team on a daily basis. 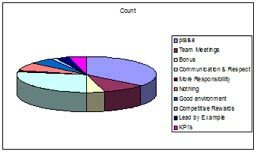 As you can see from the results as Managers you do a fantastic job of keeping the team motivated, with a high percentage being motivated by praise and communication. When it comes to your Manager motivating you we have some varying results mostly positive but some comments such as "He doesn’t", "I don’t see a Manager" and "There is no support" this is quite sad as you do lots to motivate your teams, some people do motivate themselves so this could be the reason – trying to keep it positive! In relation to preventing sickness levels we have a large 83% of business that don’t use an incentive towards sickness, however some business have a variety of way to prevent sickness levels, of the comments received others feel that “sickness is frowned upon, often bringing viruses into the workplace” While other businesses earn a raffle ticket each month for 100% attendance which are entered into a prize draw at Christmas.